Cosmetic tattooing is a way to enhance your natural beauty. Ink is carefully deposited into the dermis layer of the skin to give the results desired. Results can vary from either very natural, adding just a bit of depth where it is necessary, to a very bold and makeup look (depending on the look you would like to go for). All services offered are semi-permanent and last 1-3 years depending on aftercare, skin type, care of tattoo once healed, and lifestyle. The color of the ink, shape, and style will all be customized to your skin tone, hair color, and bone structure. To keep discomfort at a minimum, a topical anesthetic is applied to the area to keep pain at bay. Numbing cream will not only be applied before the procedure, but during as well. For most procedures, the initial appointment time varies from 1.5-2.5 hours. 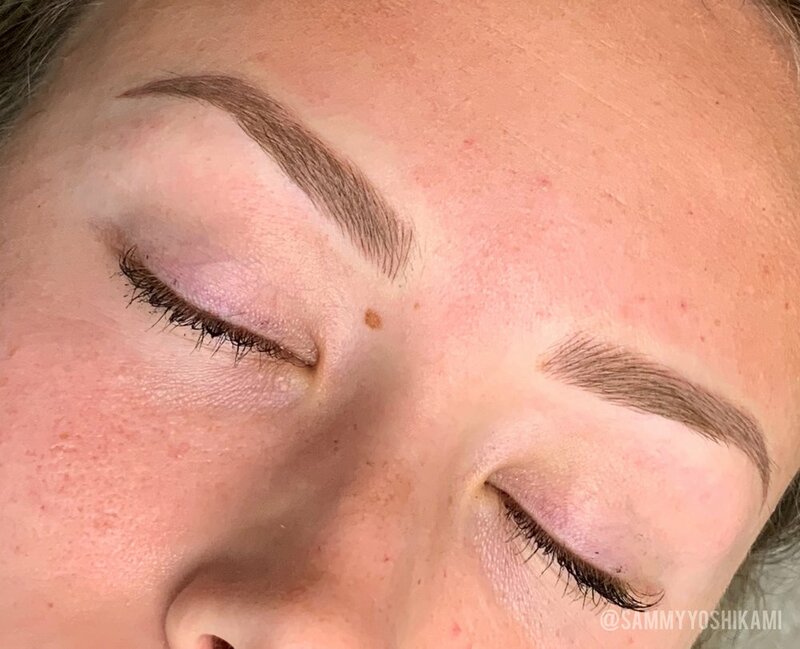 After your initial introductory procedure, your new brows may look a little dark in the beginning and during the healing process, but they will fade a couple shades lighter once healed. There is a 7-14 day healing process but it shouldn't hinder you from going about your day to day activities. The way that the brows will heal and fade will be explained to you when you come in for your initial procedure. Once they are healed, your brows may look a little on the lighter side which is very normal. You will be scheduled for a complimentary 6 week touch up where we will finalize the brows. 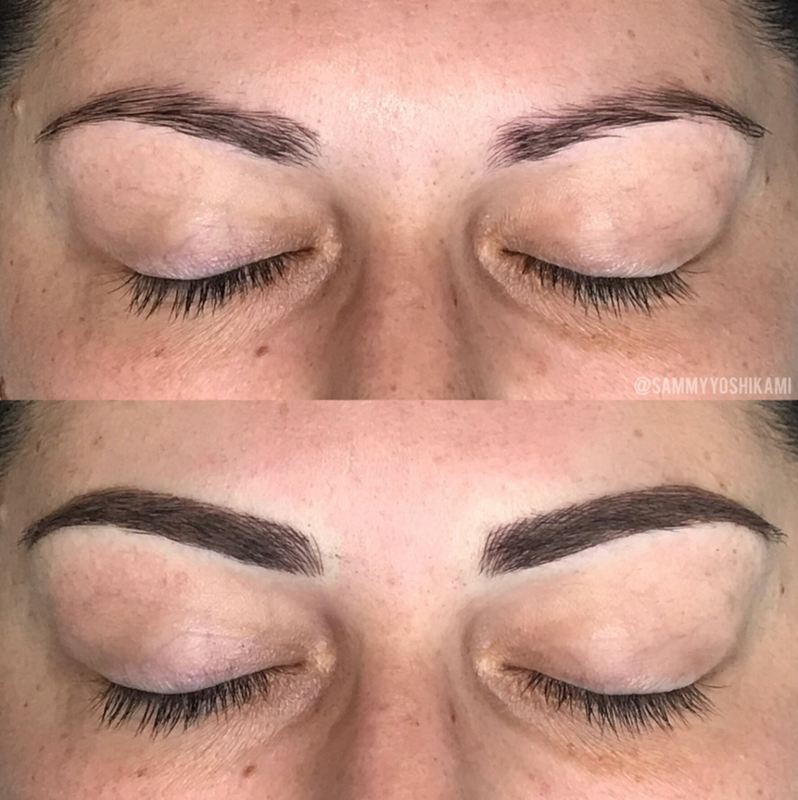 This appointment is where we fine tune and finalize the brows, thicken them if desired, deepen them in color, and fill in any spots where ink has naturally fallen out. Once you have completed both sessions, you will only need to come in annual for a color refresh touch up. 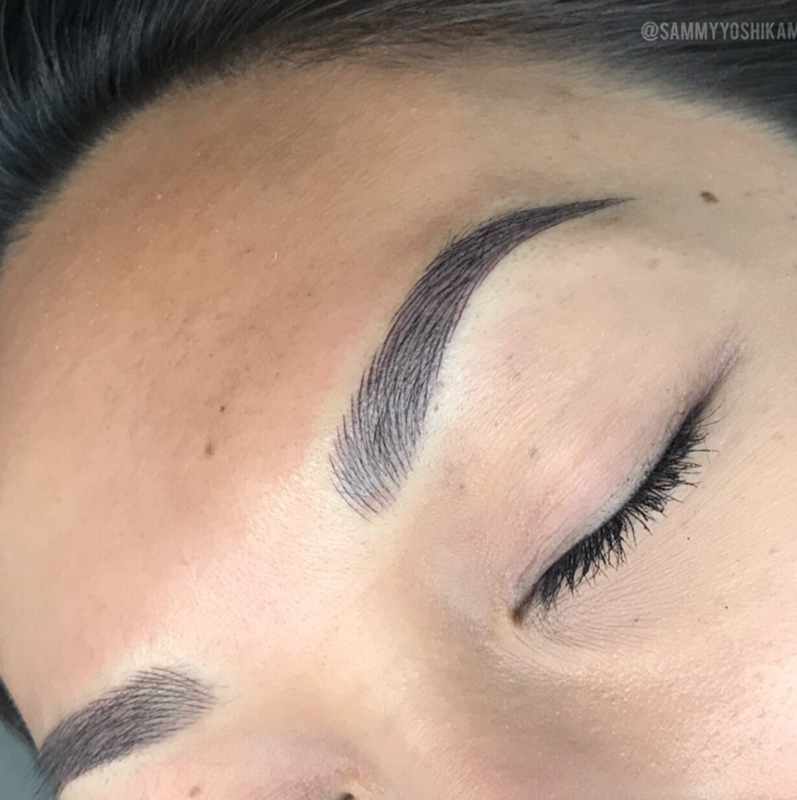 Not all brow tattoos/previous microblading can be covered. Please attach photo when inquiring to see if you are a candidate. Microblading is applied using a manual tool to give you the most natural and hairlike effect for your brows. This service is best suited for clients that either have preexisting brow hair or want a natural look. Microblading ages the most gracefully on those with dry and normal skin types, but some combination skin types can benefit from Microblading as well. For oily skin types, a Combo Brow or Shading is highly recommended instead. Shading is a technique applied with either a machine or manual tool to give a soft powdered look to the brow. This service is best suited for clients that are used to a powdered makeup finish to the brow. Results can vary from either very light to a saturated makeup look. This service is recommended for any skin type. 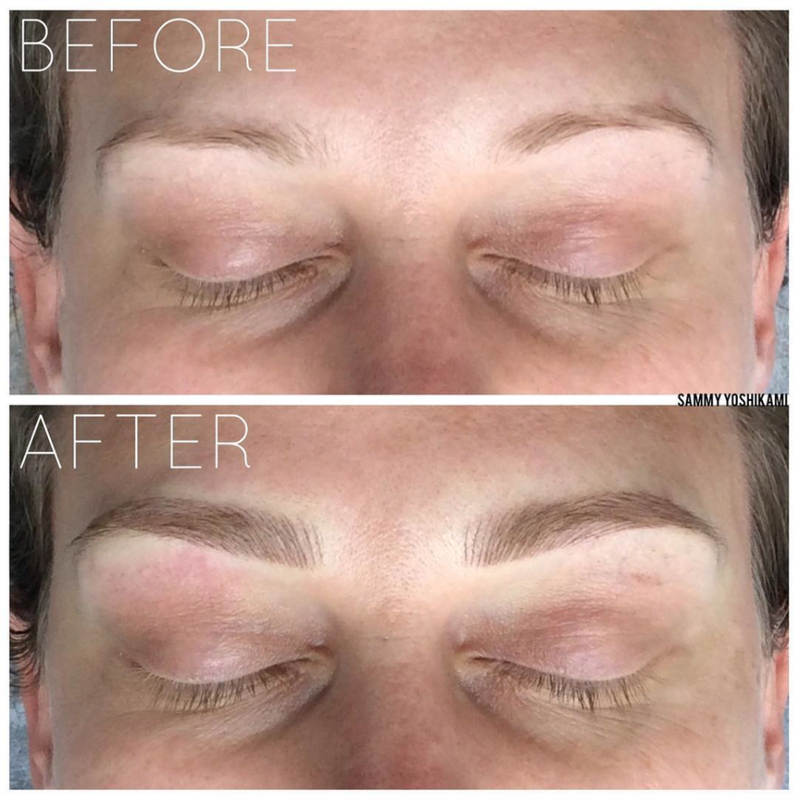 Combo brows is the combination of Microblading and Shading. 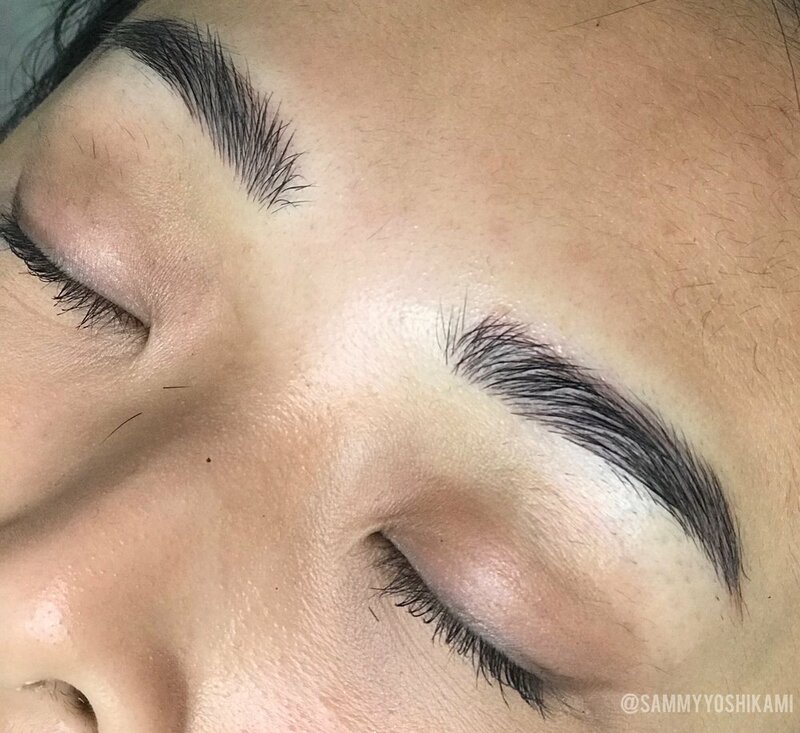 It gives you the best of both worlds: visible Microbladed hair strokes in the beginning of the brow, and Shading in the body and tail of the brow. This service is best suited for any amount of hair, and any skin type. and can be customized to the look you’d like to go for. Combo brows is the best way to get naturally full looking brows. No alcohol or caffeine 3 days before the procedure. No working out the day of the procedure. No Aspirin, Niacin, Vitamin E, Fish Oil, IBUprofen, Coumadin (Tylenol is acceptable). Showering the morning of the procedure is recommended, as you will need to keep your brows dry for the next 10 days. No waxing or tinting 3 days before the procedure (I do however recommend a waxing appointment a week prior). Consult with your Doctor before discontinuing any medication. Eat something substantial before the procedure. Bring in a reference photo of your brow inspiration. ***RetinA users (must stop usage for 3 weeks before procedure is performed). ***Bring headphones to your appointment. Do not pick or scratch the treated area as picking may cause scarring and loss of pigment. Let dry skin or scabbing naturally exfoliate off. Avoid anything that may cause the brows to get “soggy” until the last scab has fallen off (steamy showers, swimming, saunas, working out heavily causing excessive sweating). No facials, Botox, chemical treatments, microdermabrasion, Retin-A, or any other product that could speed up your skin’s cell turnover rate. Avoid any of these treatments until you are healed, preferably from your 2nd treatment. Avoid sleeping face down for 10 days. Avoid driving in open-air vehicles such as boats, convertibles, bicycles and motorcycles for the first 10 days. If you have pets at home, make sure to change your pillow cases every 2-3 nights during the healing process. If you don’t have animals, I recommend changing your pillow cases once as soon as you get home. Make sure you've carefully read and understand all the information and guidelines listed of what to do and what not to do before your procedure. If you have any questions regarding if you are a candidate or not please text or email your concerns. 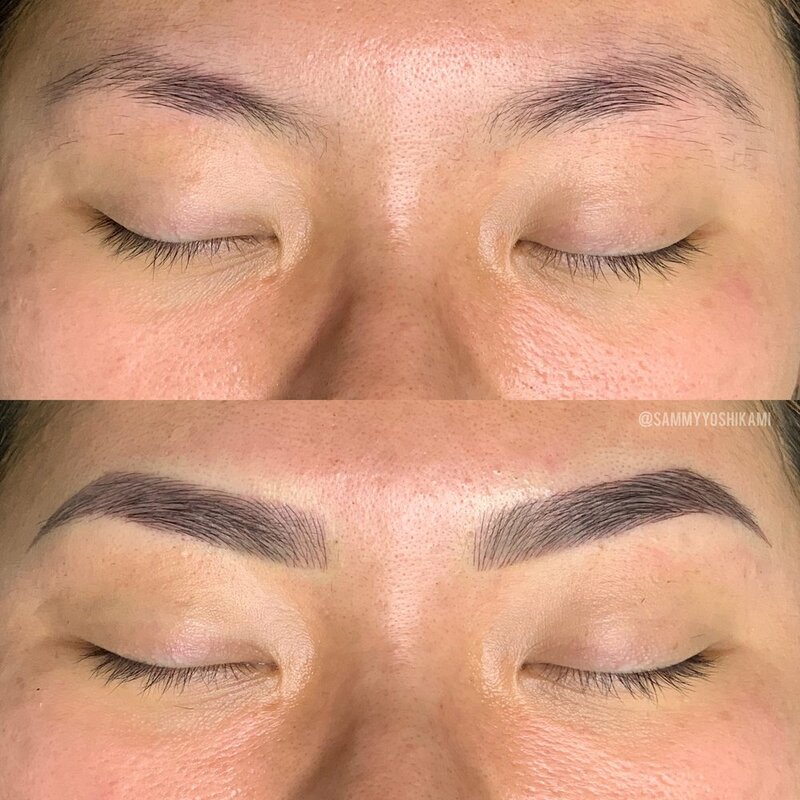 PREVIOUS MICROBLADING/ FADED TATTOO COVER UP: If you are looking to have previous microblading or a faded tattoo covered or refreshed, please text or email photos for approval prior to booking. An extra fee of $50 may be added to correct discolored brows. Some brow tattoos can not be reworked due to the brows not being faded enough. If photos are not sent over for approval, your appointment will be at risk to be declined when you come in for your appointment. ***New clients looking for a brow refresh coming from another artist must book for the full price procedure. LATE POLICY: Please arrive to your appointment on time. There is a 15 minute grace period, but if the 15 minutes is exceeded your appointment will be cancelled and you will need to reschedule. DISCLAIMER: Everyone's brows will settle in differently depending on lifestyle, skin type, skin tone, and care of your brow tattoo. Results are NOT guaranteed due to these factors. To view more eyebrow transformations, click below!